In my recent review of Cold Mountain, I talked about the glory years of Jude Law’s career, from 1999-2004, a time Enemy at the Gates falls neatly into, a fact that prompted me to rewatch one of my old favorites, a film I watched in the theatre when I was 17 and one that has always stayed with me. Law was in his prime, as was Fiennes (Shakespeare in Love) and Weisz (The Mummy). When this movie was released, those three were a formidable trio, and they came together for an epic war tale at just the right time. This film still holds sway over my heart, for some reasons that I’m sure I won’t be able to explain, but for a few that I’ll hope to over the next two paragraphs, even if no words of mine can accurately describe it. Based on the true story of one of Russia’s greatest war heroes, Enemy at the Gates is a piece of history brought to life for our entertainment and our awe. As Hitler took control of Europe and the west during WWII, he turned his sites to the east, to Asia and its rich oil fields. Beginning a battle of two fronts, the Nazis advanced to Stalingrad, a city in which the Russian army would plant its feet in the ground and refuse to move. A young sharpshooter named Vassili Zaitsev would rise in the ranks to become a lethal killing machine and one of the strongest pieces of propaganda available. But when a German sniper was called to Stalingrad to kill Vassili, a standoff would begin that could turn the tide of the entire war, a match between experts set upon a backdrop of blood, love, and the fate of the world. If you didn’t fully experience it, you’ll never quite understand; Jude Law was a force of nature around the turn of the century. He was a star, it’s that simple, a star who worked magic with an unbelievable ease. Brits playing Russians in a world of brown rubble and gore-filled sinkholes? That doesn’t sound like a recipe for success, but Law made it so. He & Fiennes, yin & yang in this film, played together perfectly, with the wonderful Rachel Weisz as Vassili’s reason for living. Add in Ed Harris, Bob Hoskins, & Ron Perlman and you’ve got yourself an ultra-stellar cast. Then there’s the music, which James Horner composed perfectly, and has since reused far too often, in my opinion. This is a war/drama/romance/epic for the ages, something that didn’t get the same attention as Braveheart, but is nearly as deserving. Don’t forget to give credit to Annaud, a director who was coming off of Seven Years in Tibet, another gem of the era. 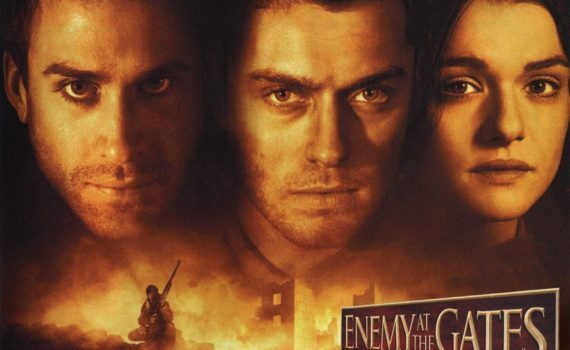 Enemy at the Gates is an example of more elements coming together and working than you would imagine possible, a well-crafted and stunningly (yet simply) acted masterpiece that every movie buff should see at least thrice.